One of the 29 footprints found in British Columbia. A popular and longstanding theory among many scientists is that the first Americans followed big game herds along a narrow, ice-free corridor that opened up in North America as the glaciers retreated. In recent years, however, an alternate theory has emerged, one known as the Coastal Migration Theory, or the Kelp Highway Hypothesis. According to this view, the first Americans migrated along the Pacific West Coast, traveling along the shorelines of what is now Alaska and British Columbia. It’s even possible that North America’s first settlers used boats, skimming the shoreline as they steadily moved south and eventually into the continent’s interior. This theory makes a lot of sense; the ocean is a reliable source of food, and much of North America was still covered in massive glaciers at the time; according to some estimates, the ice-free corridor became habitable and human-friendly around 12,600 years ago, which is about 2,000 to 3,000 years after the coastline opened up. 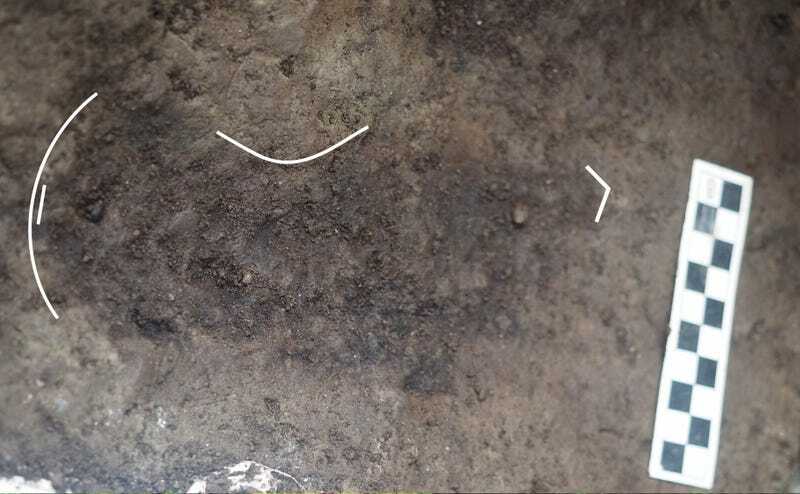 A photograph of one of the footprints found (left) and a digitally enhanced version (right). The Coastal Migration Theory sounds great, but direct archaeological evidence to support it is scant. That’s why archaeologist Duncan McLaren, and his colleagues from the Hakai Institute and the University of Victoria, decided to dig around the intertidal zone of a beach on British Columbia’s Calvert Island in search of clues. At the dawn of the Holocene Era, sea level in this area was about six to nine feet (two to three meters) shallower than what it is today. The researchers were hoping to find physical artifacts and relics dating to the period between 14,000 to 10,000 years ago—but instead, they unexpectedly found 29 human footprints in an area measuring 12 feet by 6 feet (4 x 2 meters). A view of the excavation site. This is pretty wild, because ancient footprints have only been discovered in three distinct places in the Americas, namely Argentina (dated at 14,000 years old), Chile (14,600 years old), and Mexico (two pathways, one dated at 10,700 years old, the other at 7,200 years old). The prints were found pressed into a layer of paleosol (former soil preserved underneath sediments) that was radiocarbon dated to between 13,317 and 12,633 years ago. Wood samples taken from the same stratigraphic layer were used for the dating. Detailed measurements and photographic analysis suggested the prints were made by three individuals, two adults and a child. The presence of toe prints indicates these people were barefoot when the impressions were made. Map of the site with footprints indicated. Ben Potter, an archaeologist at the University of Alaska Fairbanks who wasn’t involved in the new study, likes the paper, saying it helps us understand the antiquity of northern coastal occupations, but it doesn’t radically change our understanding of the initial colonization of the Americas, nor does it add to evidence supporting a coastal migration that would have taken place thousands of years earlier. “It would push evidence of Northwest Coast human occupation back about 400 years, but it still postdates the widespread occurrence of Clovis populations throughout North America around 13,500 to 12,900 years ago, and the earliest interior Beringian materials at 14,300 years ago,” he told Gizmodo. By Clovis populations, Potter is referring to a prehistoric culture known for their projectile points. Haynes thought it was interesting that the youngest possible date of the footprints was placed at 12,633 years ago, which is within the range of Clovis archaeological sites, and in fact younger than some Clovis sites. “This evidence does suggest that humans were present on the western North American coast around the time of Clovis elsewhere in the continent,” he said. As these scientists point out, the new evidence isn’t earth-shattering, but it does fit in rather nicely with what we already know, or at least suspect, about how and when North America was colonized. It’s further proof that ancient humans occupied the northern west coast at this early stage (a few hundred years earlier than previous estimates, as Potter pointed out), albeit a few thousand years after the first wave of migrants flowed into to the continent. The next challenge for archaeologists will be to find more, and older, archaeological evidence along the west coast to bolster the Coastal Migration Theory even further.